Jack Handey is a real live person. In fact he was born in San Antonio, Texas in 1949. That's about as real as it gets. He attended the University of Texas at El Paso and worked at the San Antonio Express News before he started his comedy writing career. In the 1980s, Jack Handey worked with Steve Martin as a writer for the television movies "Steve Martin: Comedy Is Not Pretty" and "Prime Times." Then the skies opened up and he was hired as a writer and creative consultant on Saturday Night Live. At SNL, his Deep Thoughts segments, which were introduced by Phil Hartman but which he wrote and narrated, became hits that endured for years. 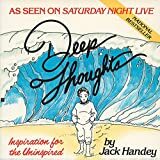 Jack Handey wrote for SNL from 1985 to 2002. In Jack Handey's world, the bizarre is normal. His Deep Thoughts are twisted and wonderful. "The face of a child can say it all, especially the mouth part." "I hope life isn't a big joke, because I don't get it." 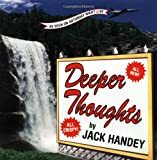 Do You Think Jack Handey Has Deep Thoughts? "If you think a weakness can be turned into a strength, I hate to tell you this, but that's another weakness." "If you ever fall off the Sears Tower, just go real limp, because maybe you'll look like a dummy and people will try to catch you because, hey, free dummy." "Friendship is like peeing your pants. Everyone can see it, but only you can feel its warmth." "I wish outer space guys would conquer the Earth and make people their pets, because I'd like to have one of those little beds with my name on it." All I have to say about those little beds is who wouldn't want one? Jack Handey, like him or hate him, wins the weird prize. I personally like him. His sense of humor is unique and well, it makes you think (even if what you think is 'what was he thinking?'). "I wish I would have a real tragic love affair and get so bummed out that I'd just quit my job and become a bum for a few years, because I was thinking about doing that anyway." "There should be a detective show called 'Johnny Monkey,' because every week you could have a guy say 'I ain't gonna get caught by no MONKEY,' but then he would, and I don't think I'd ever get tired of that." "I bet a funny thing about driving a car off a cliff is, while you're in midair, you still hit those brakes." 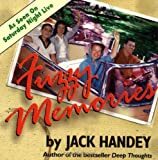 Jack Handey's insight into still hitting the brakes just shows how hopeful a person he is. The fridge is the perfect place to chill with some deep thoughts, man. Who knew? I love stuff like this, that was great, and I have some new quotes for my refrigerator now, ha ha! I agree that Jack Handy may not be deep but he is hilarious! A local restaurant has the Jack Handey bum quote written on a chalk board outside. Because I don't have a TV, I didn't know who he was. Thanks for clearing up the mystery. I think he's funny in a weird kind of way, but deep? Maybe he thinks deep thoughts are odd ball. I used to love Jack Handy. Not sure if he is really deep, but he was really funny! I do remember Jack Handy but not these particular one. These are FABULOUS! I have enjoyed his skits and random thoughts on SNL. Yes, Jack Handey's weird POV is right up my alley. I was just reading some of his quotes online the other day and remembering how much I like this guy! Abraham Lincoln was born in Kentucky but moved to Illinois where he spent most of his adult life. Take a virtual tour of the Lincoln sites around Springfield, Illinois.